Yes folks, it's official. 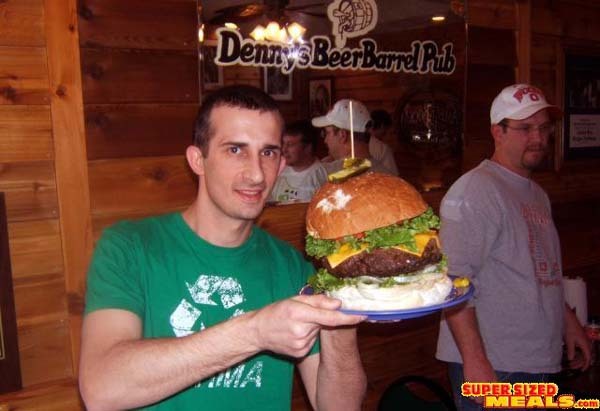 Denny from Denny's Beer Barrel Pub now owns the title of the "World's Largest Commercially Available Hamburger". 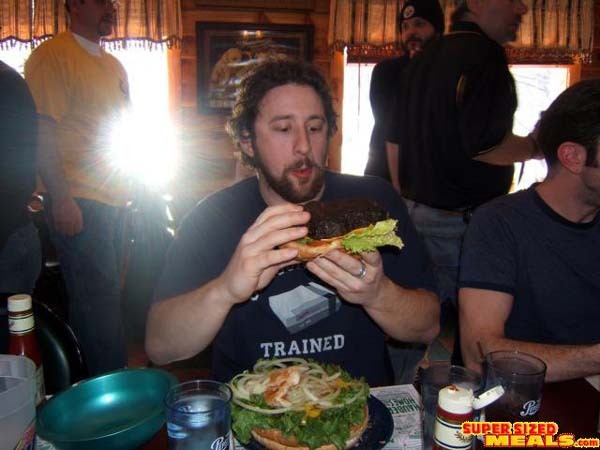 Weighing in at a staggering 123lb's, and called "The Main Event", this is the biggest burger you will find on any menu, anywhere in the world! How much will it cost? The listed price will be $379. 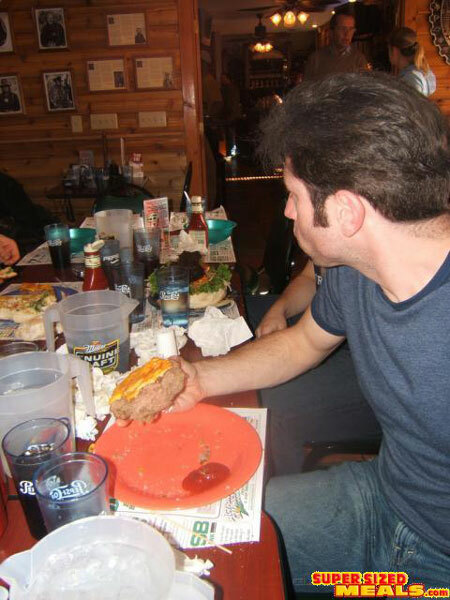 Megamunch and members from the UEPa went up to take part in the event, and help Denny get rid of some extra burgers! But with greatness comes some sad news. Apparently during the speech, Denny mentioned that this would be his last attempt at the record. Nothing like going out on top Denny, congratulations! A big thank you to MegaMunch for the story and the pics! Every time I go to Dennyâ€™s (which is twice now) I get a giddy feeling when I pull into the parking lot and feel a little sad when I have to leave. Granted, the former is probably due to me having not eaten in 24 hours prior to arriving and the latter might have something to do with having three or four pounds of burger in my belly, but thatâ€™s just how I feel. 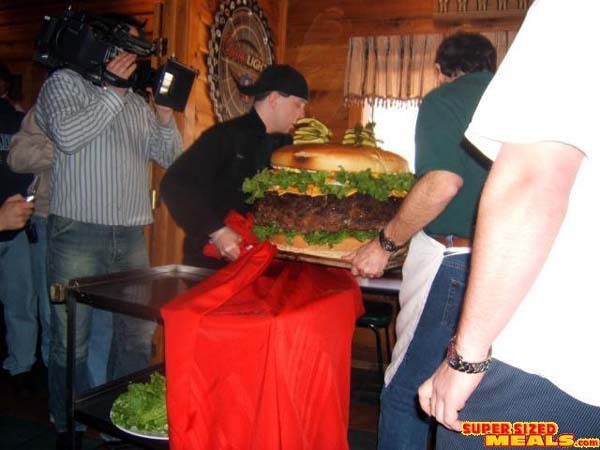 For the most recent visit, six members of the UEPaâ€”all pictured belowâ€”were asked by Denny to visit on Saturday and be part of the unveiling of Dennyâ€™s new â€œWorldâ€™s Largest Burgerâ€� (123 pounds). 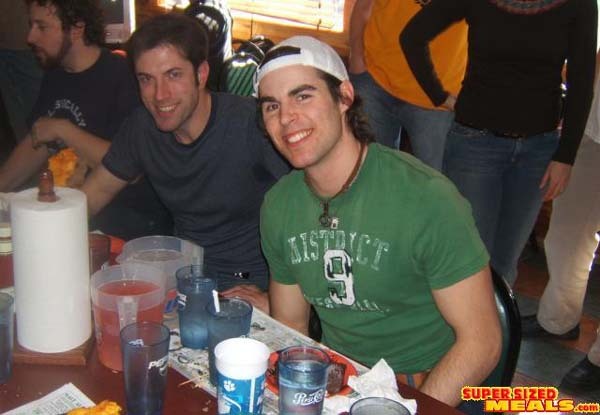 We also participated in a two-pound burger eating contest (roughly five pounds total). 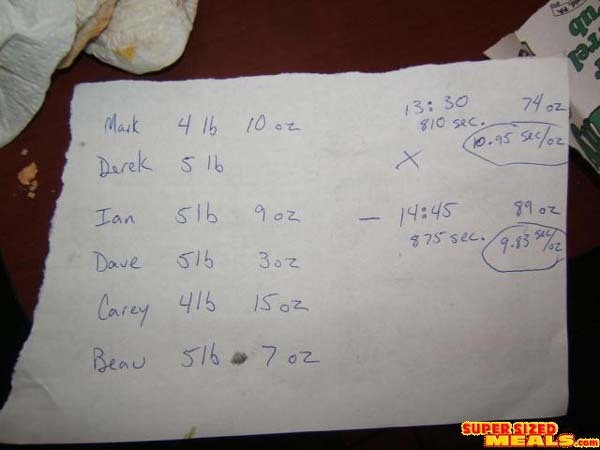 The details of Ian Hickman and Mark Lyleâ€™s attempts are detailed in photos below, but Beau, myself and Wing Tut all ran out of time, having eaten about four pounds of our burgers when the hour expired. In his Dennyâ€™s debut, the newest member of the UEPa, Carey Poehlmann, was victorious. 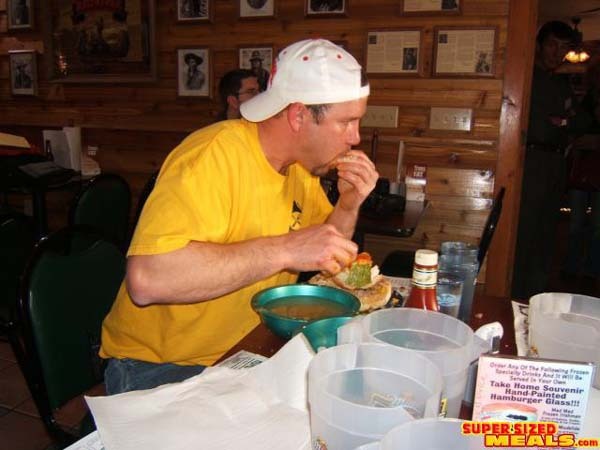 He downed his last bite at the 57 minute mark and now has his name on the wall at Dennyâ€™s Beer Barrel Pub. Pssh! Rookies. 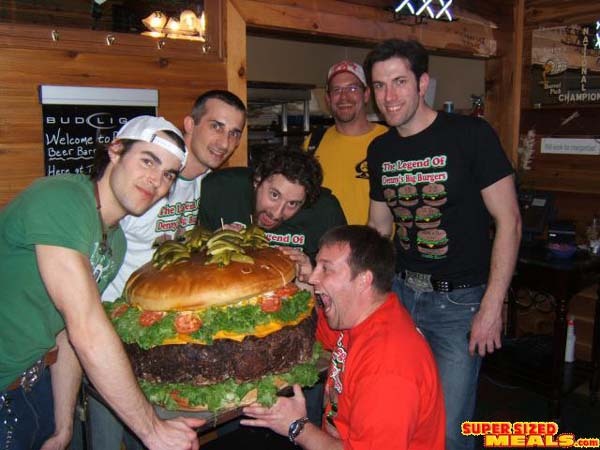 The six members of the dayâ€™s UEPa team posing with the largest burger ever created (123 pounds). The burger was unbelievable and almost didnâ€™t look real. 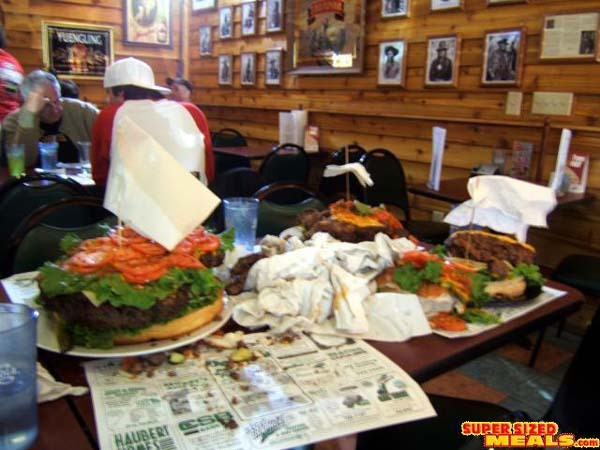 Iâ€™m still trying to figure out how the 100+ pounds of burger and top bun didnâ€™t crush the bottom bun completely flat. Maybe some ingenious support system was in effect. From left to right: Ian â€œThe Invaderâ€� Hickman, Dave â€œMega Munchâ€� Shoffner, Beau â€œBeauhemianâ€� Faulkner, Mark â€œThe Human Vacuumâ€� Lyle (yellow), Derek â€œWing Tutâ€� Payne (red), Carey â€œStill Needs a Nicknameâ€� Poehlmann. 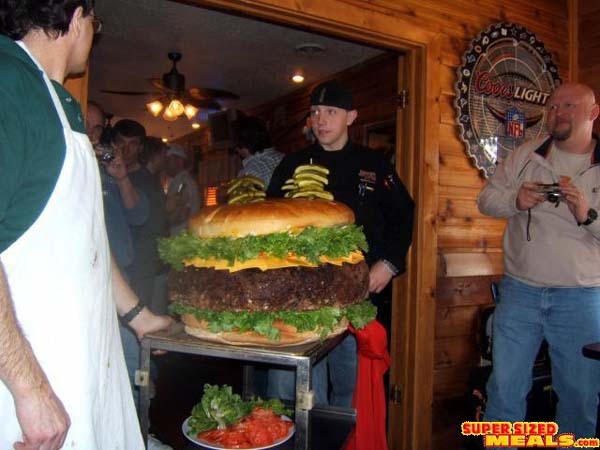 Phil, the chef and artist behind the burger, applies some greenery before the burger tips the scales at 123 pounds. Denny is in the apron on the right. He gave a heartfelt speech to the packed room and said that this would be his last attempt at the record. 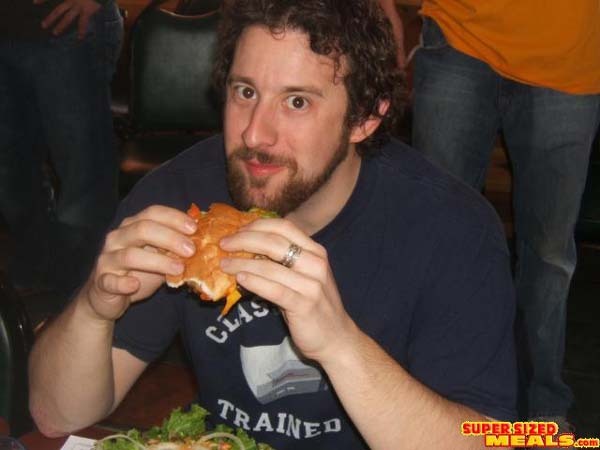 He did say that when his son takes over the restaurant, he may choose to keep the burger wars alive. 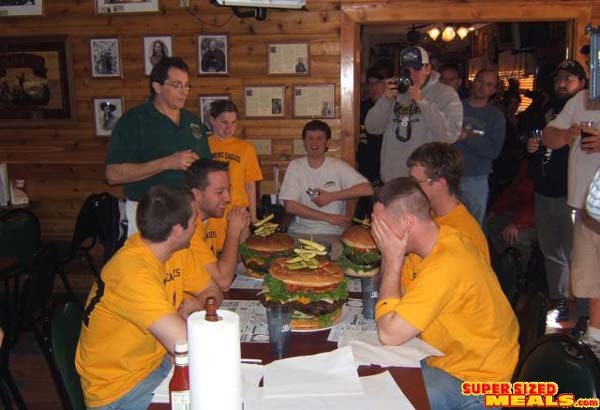 The dayâ€™s only finishers of the two-pound burger. Beau's girlfriend Katie digs into Beau's scraps after he wisely threw in the towel (thatâ€™s him on the right envying her technique). On the drive up there she seriously considered competing and still thinks she could have been a contender. After seeing her gnawing fearlessly on Beauâ€™s cold, congealed left overs, I would have to agree. 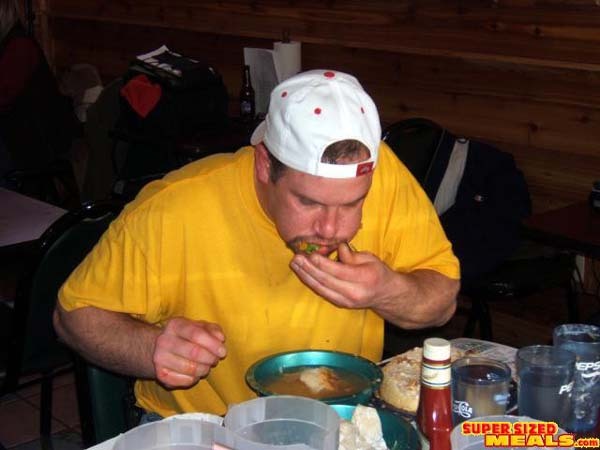 This is a team of eaters from South Jersey called the Screaming Eagles. They would attempt the 15-pounder (two person team in foreground), the famous Ye Old 96er (one man, back left) and the three-pounder (one man, back right). With their yellow shirts they definitely took the award for â€œBest Eating Team That Looked Like An Actual Teamâ€�, reminding all UEPa members that we really need to get some t-shirts. Despite their uniformed approach, the burgers would be the winners in this battle. 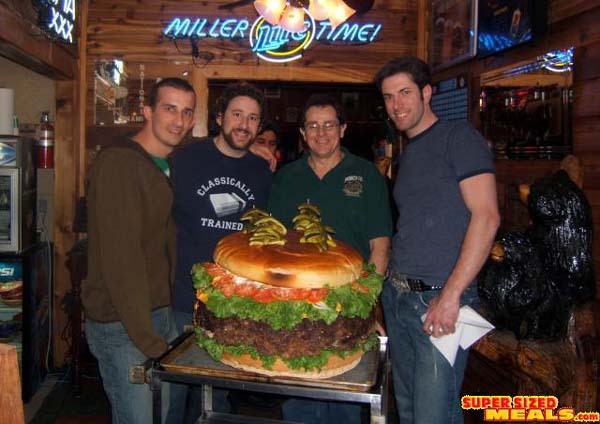 Left to right: Me, Beau, Denny and Carey with the new world's largest burger. These are the weights of the burgers with the 13 ounce plate included. The calculations on the right determined Mark and Ian's seconds-per-ounce times, but were off slightly because we forgot to subtract the weight of the plates. More eating from the Vacuum. 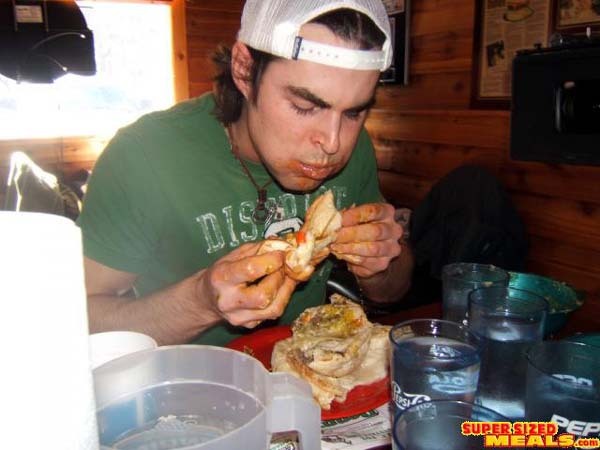 Ian Hickman devours his burger while a German TV crew watches. White flags signal defeat in the scraps leftover from the Screaming Eagles' attempts. Left to right: 15 pounder, Ye Old 96er (6 lb) and three-pounder. Ian (white shirt) talks to a team of eaters from South Jersey called the Screaming Eagles. 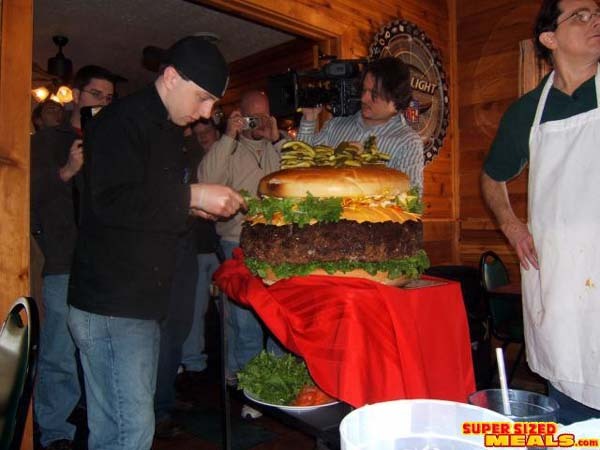 They would attempt the 15-pounder (two person team), the famous Ye Old 96er (one man) and the three-pounder (one man). All three burgers would emerge victorious. 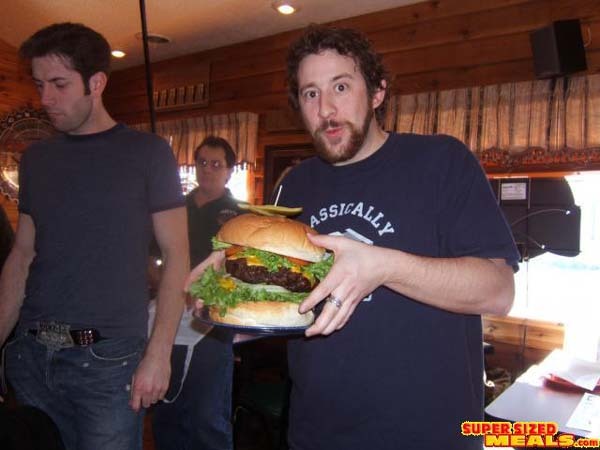 Denny and Phil with the burger. Denny was giving a speech and getting a bit choked up at all the support he'd received over the years and recently. He said this would be his last attempt at the record. Denny (left) and Phil (the burger chef/artist) wheel in the giant burger. My packing it in at the 58 minute mark. I had a big meatball and about three-quarters of the bottom bun left. 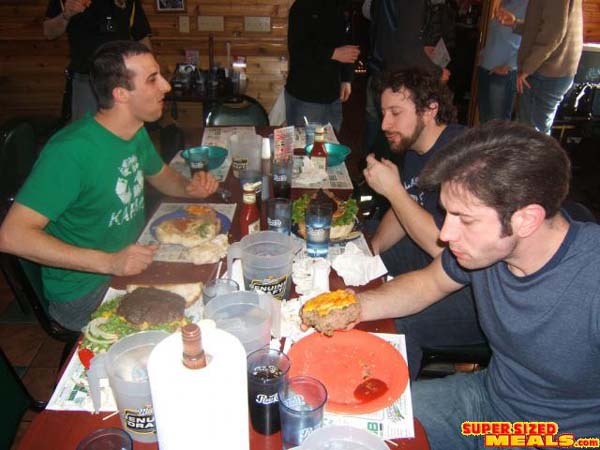 Me (green), Beau and Carey (foreground) chowing down around the 45 minute mark. 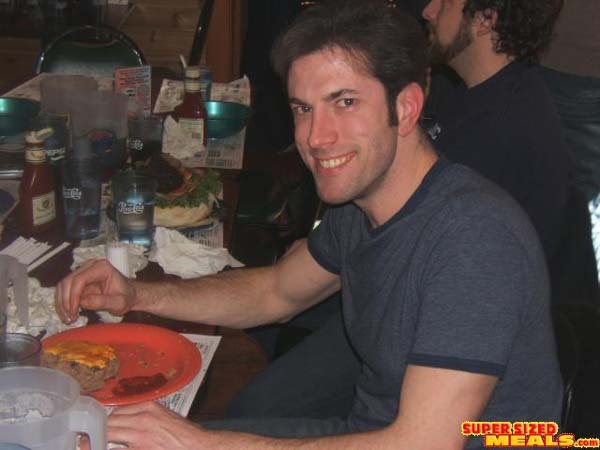 The burger next to me was the remnants of the German TV host's attempt. Carey putting the last of it down. Carey near the end. 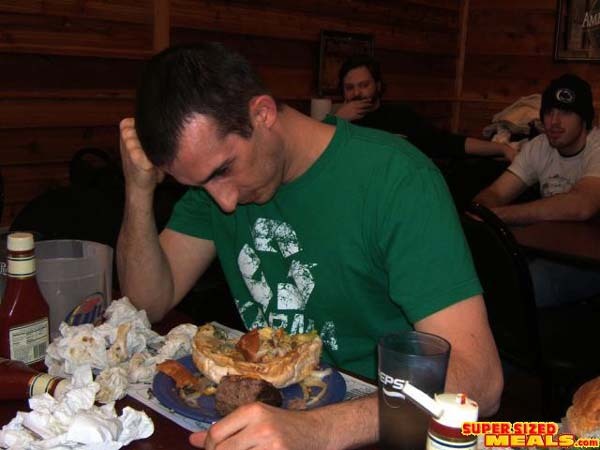 He would eat what's left on his plate and finish with a time of 57 minutes...good enough to get his name on the wall. 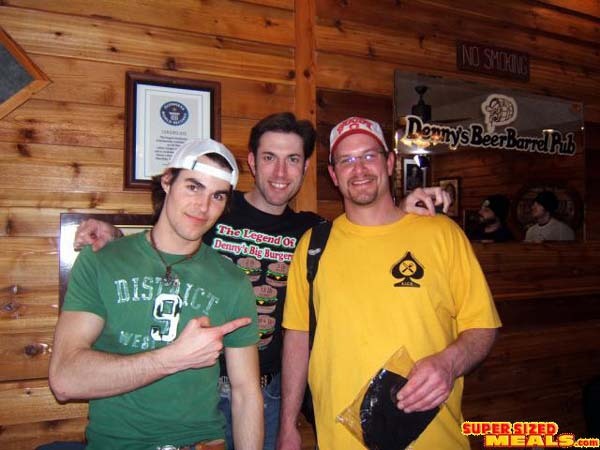 UEPa member Beau Faulkner and Denny with the burger, named "The Main Event". 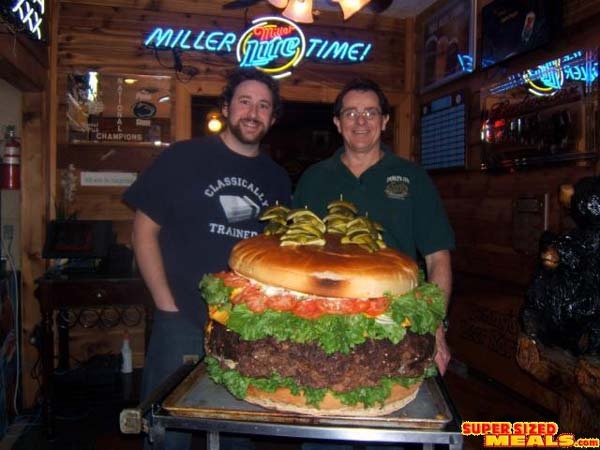 Denny (right) and the burger's chef/artist Phil put the new world record burger on the scale. Total weight 123 pounds, easily topping the previous record of 105 pounds. 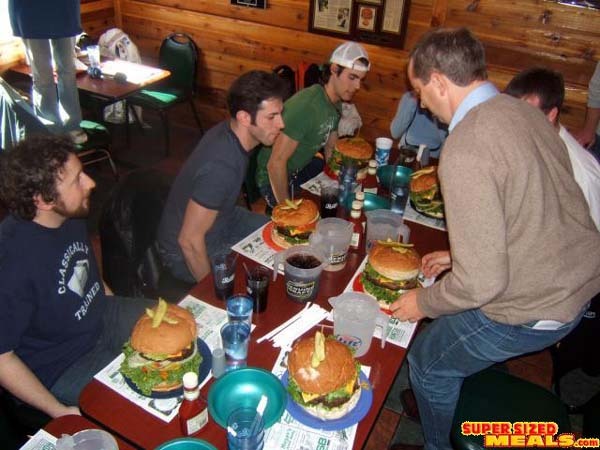 The UEPa crew getting ready to dig in to their 2 pounders. The guy in the grey sweater is the host from the German TV show that taped the day's events. He tried eating with us but bailed out at the 10 minute mark. YEah, that day was truly unforgetable, Billy. You definitely have to make it out there sometime! Definitely! 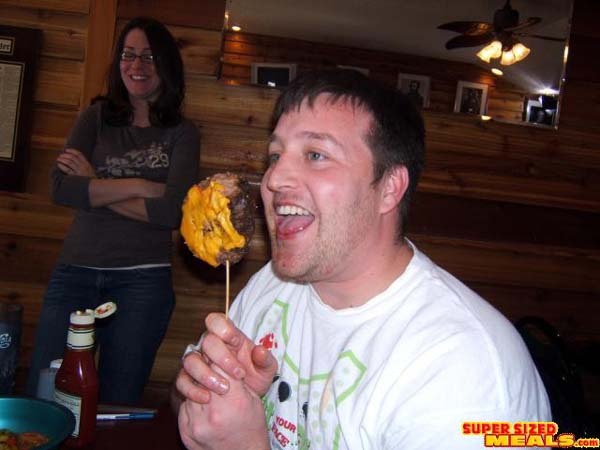 If I'm even anywhere near Clearfield, PA, I'll definately be stopping in for a burger. Might be big, might be small, but dammit I'm gonna make it one of these days! 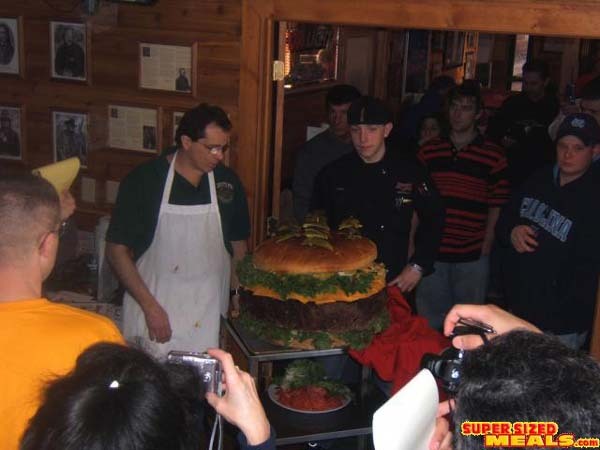 So, how many people did it take to finish a 123lb burger? When's the next foodfest trip?